Recently, I had the opportunity to hear Christian Smith, Ph.D. present on his latest research. He’s the mind behind the Science of Generosity at the University of Notre Dame. While they’ve shared a few initial findings publicly, he asked that I hold off on sharing the results he presented, as he expects this to maintain a level of academic rigor. That said, there are some fascinating questions and key results that you’ll want to see. One thing Dr. Smith introduced was the idea that generosity is both an attitude and an action, and it’s broader than financial giving. Generosity extends to relations (family) and neighbors (friends) as well as institutions. Dr. Smith started by explaining his project and some of the questions that drive their research. Not only are these interesting, the answers could influence much of philanthropy, fundraising, and sociology. Why are some people extremely generous vs. moderately vs. not at all? What factors foster or obstruct generosity? Is generosity intrinsic to humanity or is it cultural/learned? Can “causal mechanisms” be intentionally (but non-manipulatively) stimulated to increase generosity? How do givers benefit from generosity? Are there negative consequences of generosity? There are articles about why people donate (15 reasons why people donate and why do people donate to charitable causes). But there doesn’t appear to be extensive, serious research. That’s where this project is so exciting. The bulk of his presentation covered the “29 factors most strongly associated with generous financial giving by all Americans, from strongest to weakest.” On the face of it, this sounds a bit dry – but presented from 1 to 29, with just a bit of elaboration, there were some phenomenal insights. The strongest factor was whether the donor made a choice to give, rather than simply caving to an appeal. It’s the difference between someone ringing your doorbell to ask for money and you deciding to make a gift before the appeal it made. You can’t make the choice for someone, but you can talk to people about the importance of donations. Another strong factor is giving in a regular structured system or routine such as a monthly giving plan. For many of us, this can mean pledge programs, payroll deductions, or other scheduled giving. This is relatively easy to set up, and it can certainly help in our appeals to frame a gift in terms of many small gifts rather than a single cumulative amount at the end of the year. Seriously, my donation could accomplish that?! People who get excited about the prospect of their money making a difference are more likely to give. Tell the story about what donations accomplish, and live up to that expectation. One factor (not the strongest, but not the weakest) is understanding the process for making a donation, where to give, how to evaluate giving options, etc. I’ve actually talked to people who said they wanted to help, but weren’t really sure how. 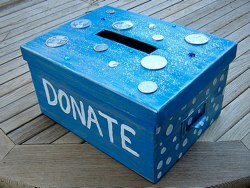 For people who don’t have a lot of experience with donating, it may not be intuitive. Make the donation process obvious, easy, and completely filled with joy. Knowing what happened with your donation influences giving. We know our job is to show donors the good that comes from their donations. Don’t forget to keep showing specific impact and results after the donation is received. What’s next for the research? Dr. Smith will certainly publish the results, and he’s got a book coming next year. I’ll certainly get the book, and let you know when it’s out. But he says their next project will include field studies and continued support of their initial rounds of research grants. As they share more results, I’ll be sure to share it here.